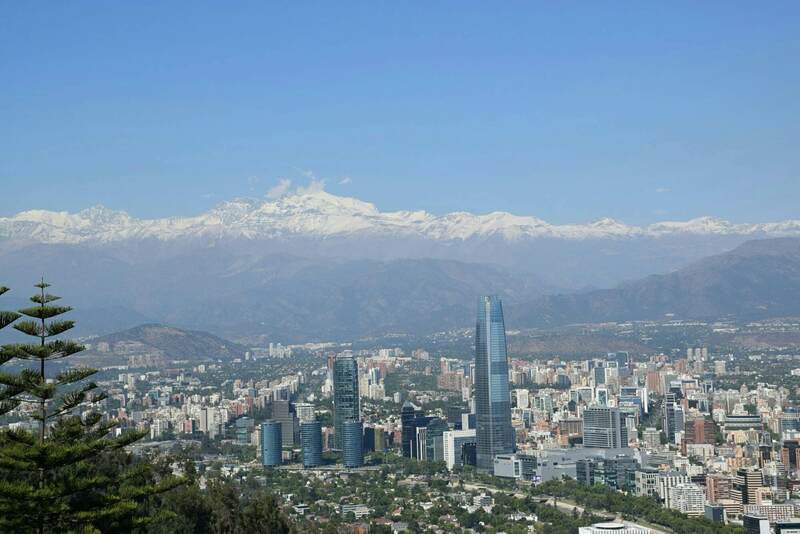 Before going to Santiago, everyone we met said it was somewhat of a “boring city” with “not much to do.” This is a common misconception and therefore many people only spend one or two nights here strictly in transit. We had a flight booked from Santiago to Rio for December 29 so we easily could have just made it a short transit stop. Luckily, with Christmas so close we knew we had to get to the city early if we wanted to see any of it so we got a good 6 nights here. 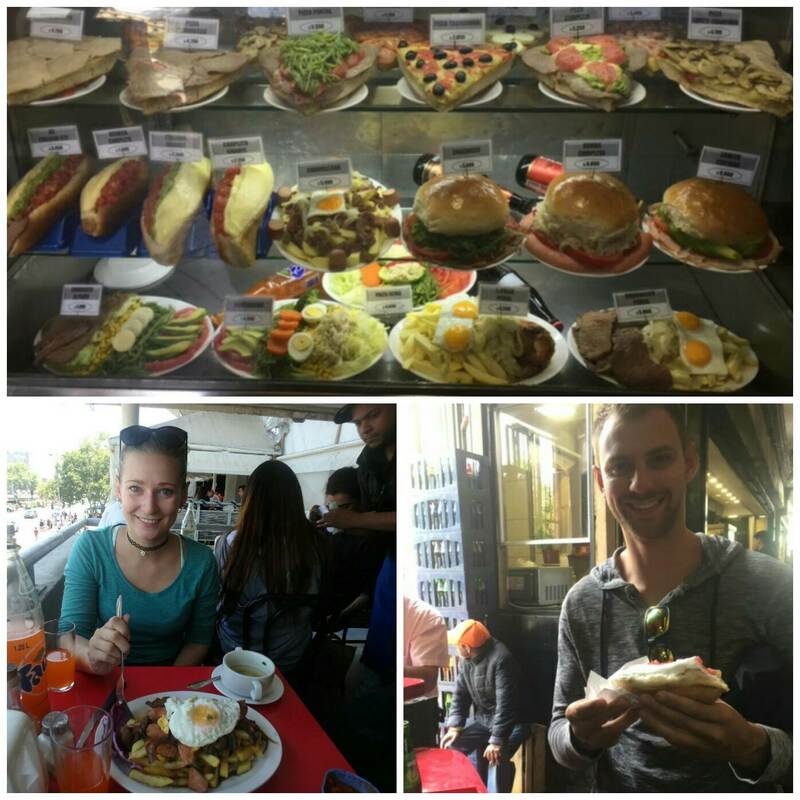 In this time we were able to properly explore the city and see the variety it had to offer and in turn, we really loved it. We started off Santiago with a bang. We went for my early birthday dinner (almost everything is closed on the 24th) at a restaurant that looked like a castle. After we ended up having a huge night out on the town with a large group from our hostel. At midnight, a group of people from Venezuela sang their traditional version of “happy birthday” to me. We went out in the area of Bella Vista which is near the university so there is a young party vibe in this neighbourhood which is lined with massive nightclubs and various street food, that night ended with a late night Completo (hot dog) which are a very popular food in Chile although they’re not that nice. Naturally, the 24th was a right off due to extreme hangovers but on Christmas Day we went on a walking tour of the city. We were shown the presidential building and got a lesson about the socialist past of Chile which was overthrown by a military dictatorship. It was interesting and good to see the tourist area of the city. I was pleasantly surprised at how clean and liveable the city was. The metro was easy to navigate, the people are very friendly, the parks are beautiful and well-kept, and the entire time I was there I felt safe. Chile is home to some 200,000 street dogs that are all really friendly and well fed, if your lucky enough one might even follow you home keeping you safe the whole time. These dogs live side by side humans in this city and its so cool to see the compassion Chilean people have for there 4 legged friends, its something alot of people all around the world could learn something from. 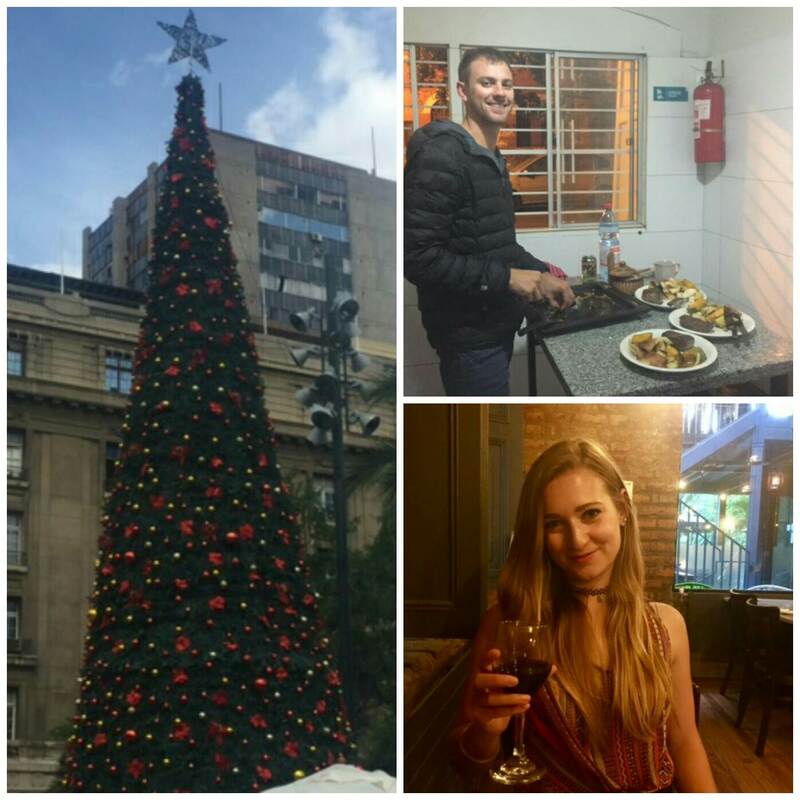 We celebrated Christmas with a guy from our hostel with steak, roast veggies and potatoes, as well as ample amounts of wine. Although it didn’t compare to being at home with family and friends it was still a great day. It is always nice to be surrounded with good people over the festive season because they can truly make you feel like your at home. We liked the walking tour so much we joined a different one the next day which took us to a less touristy area of Santiago. 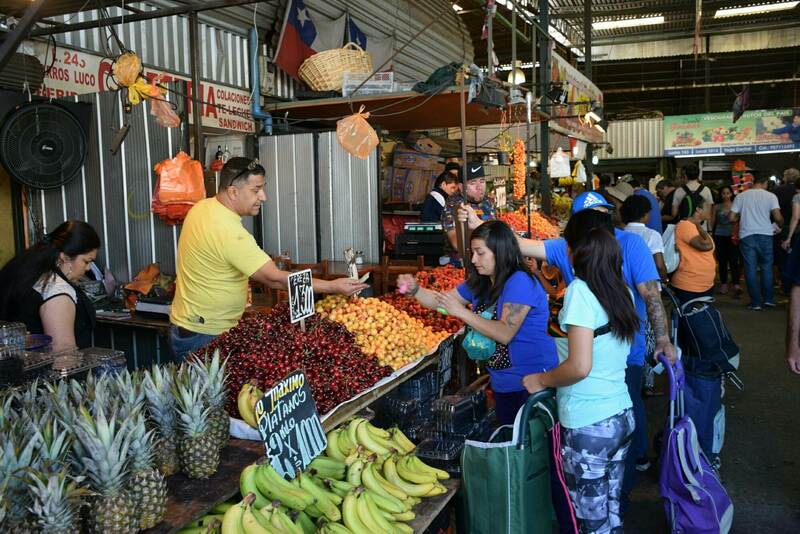 We went to various markets and experience how the “working class” people live, we saw fisherman selling all their fish t stalls, small restaurants and street food, hundeds of fruit and vegtable stalls, and people carting various things around on carts. This was very interesting as the following day we went to an area commonly referred to as “Sanhattan” which is the upper-class business district. Going from crazy markets to people in expensive suits within the same city is pretty crazy. It definitely shows the diversity of classes within Chile, which is something a lot of citizens really want the governement to change. Overall, Santiago was surprisingly great! I would definitely go back for a long term amount of time. 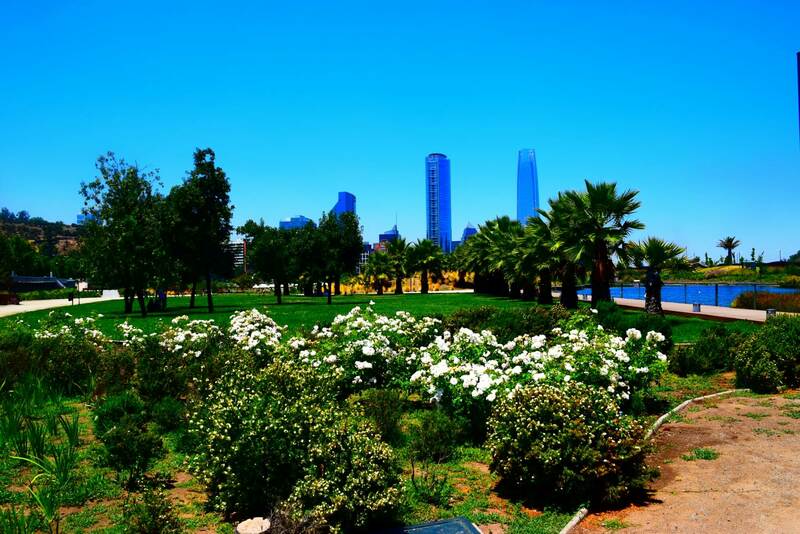 Daniel and I have even talked about getting working visas for Chile sometime in the future, it seems so livable and enjoyable.